Just your everyday community police presence. EPA/Noah Scialom. By the time the police van arrived with Gray at the Western District police station some 45 minutes later “he could not talk and he could not breathe”, according to a police officer quoted in the Baltimore Sun. It was only then that police called medics who transferred him to hospital. Doctors determined that Gray had three fractured vertebrae and a damaged larynx, his spinal cord 80% severed at his neck. Gray died of his injuries a week later. 'No Justice, No Peace' has echoed through the streets as thousands of people have protested following Gray’s death. Protest marches on 25 April and walk-outs of students on 27 April were followed by what some call rioting, others unrest or rebellion. Officials and mainstream news coverage have decried property destruction, including the burning of police cars, and theft. Gray’s death at the hands of the police was the latest to provoke protest. Natalie Finegar, the deputy district public defender, said that it was a “daily occurrence” for her clients to describe some sort of mishandling by the police. These range from “jump outs” where officers spring from patrol cars and shake down a suspect, to serious assaults. 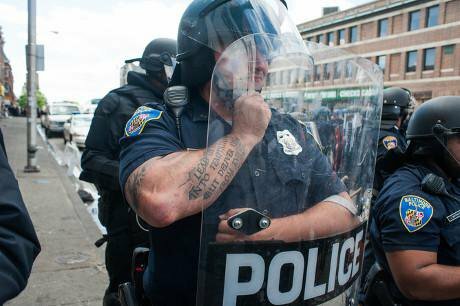 The city of Baltimore paid out more than $5.7m in undue-force lawsuits between 2008 and 2011. But property destruction is not equivalent to death—particularly in a context where so many black people are killed and harmed by police with near impunity. It is telling that there are no comprehensive data on homicides by police in the US. A partial snapshot from recent FBI data reveals that a white police officer killed a black person in a “justifiable homicide” about twice a week in 2005-12. Anger over police treatment of black suspects. EPA/Andrew Gompert. The protests communicate a legitimation crisis over policing in the United States. A cycle of renewed dissent against state racial violence has become increasingly visible since July 2013, following the acquittal of George Zimmerman for the murder of Trayvon Martin. 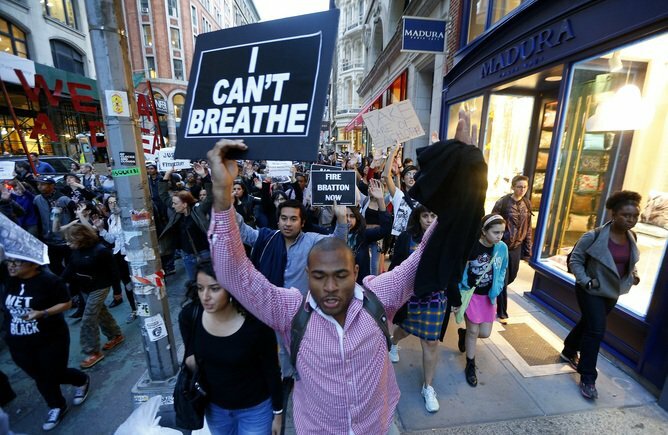 'Black Lives Matter', 'Hands Up, Don’t Shoot', 'I Can’t Breathe' and 'Shut It Down' have become protest slogans after the killings of Michael Brown in Ferguson, Missouri and Eric Garner in New York City. Across the Atlantic, 'No Justice, No Peace' was also the cry of protesters gathered to hear a verdict of 'lawful killing' in the case of the police shooting of Mark Duggan in London, 2011. Duggan’s death sparked the most extensive riots in recent British history. As with recent events in the US, the English summer riots of 2011 raised serious concerns about policing within inner-city communities. The findings of the 2011 research project run jointly by the Guardian newspaper and the London School of Economics, Reading the Riots: Investigating England’s summer of disorder, suggested that the riots were motivated by a sense of “poverty, injustice and a visceral hatred of the police”. Some 73% of people interviewed said they had been stopped and searched by the police at least once in the previous year. Time and again, anger over perceived misuse of 'stop-and-search' has been one of the causes of rioting in Britain. In 1981, riots in Brixton sparked three months of rioting by black, Asian and white youths across most of the country’s inner cities. The Brixton uprising was triggered by Operation Swamp 81, which saw the police employ ancient vagrancy legislation, called 'sus (suspected person) laws’, in a mass stop-and-search operation. Guilty until proven innocent: stop-and-search in practice. David Parry/PA Wire. The Scarman Report into the causes of the 1981 riots stated that the black population of Brixton had been subject to “disproportionate and indiscriminate” policing. Sus laws were repealed, yet stop-and-search substantially increased. 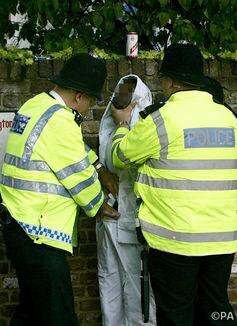 An estimated 1m stop and searches are carried out in the UK each year and in 2009-10, according to the Equality and Human Rights Commission, “Black people were stopped 23.5 times more frequently than white people and Asian people 4.5 times more frequently." In 2014, a revised code of conduct on stop-and-search was introduced; recent figures show a 12% reduction but more radical reform is required. Fifty years since the civil rights movement and the ostensible end of state-sanctioned discrimination, austerity and welfare retrenchment has created even deeper divides. A recent special issue of Feminist Review on the politics of austerity details the multiple ways in which “divides of gender, race, ethnicity, sexuality and class” are intensifying. The UK and US are relying on the same forms of policing to resolve the resulting economic and political conflicts. Racial and economic inequality fuelled the riots in London in 2011 and the same thing has sparked the unrest we see in Baltimore and other US cities today.